Nut-based pie crusts are becoming more popular as people with diet restrictions and health conditions look to substitute sugar and gluten while maintaining the great taste and texture of their favorite desserts. This pecan nut pie crust is the perfect foundation for the Thanksgiving staple, pumpkin pie. This recipe can be used as a substitute for any traditional flour-based pie crust, with other custard or pudding fillings like sweet potato pie, key lime pie, or lemon buttermilk pie. Although it uses a few dates for sweetness, this crust is still lower in carbs than the traditional flour-based crusts. 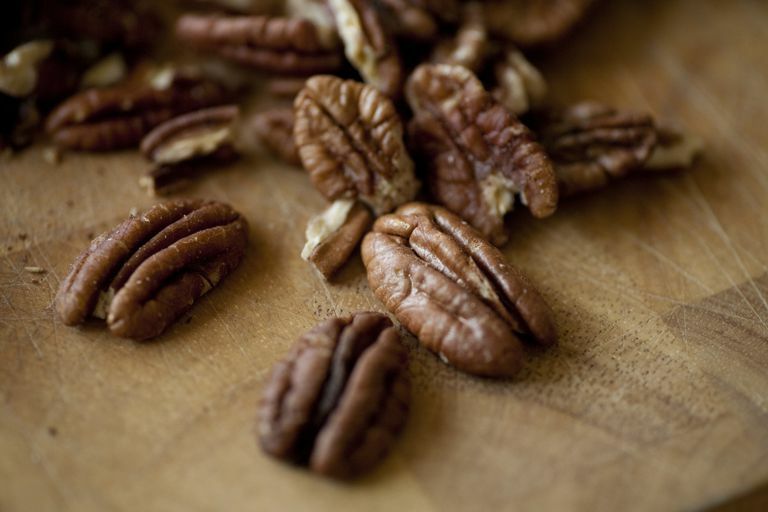 Place pecans pieces into a food processor (you can use a blender, but be careful not to blend them down too small). Pulse the processor until the largest pieces are as big as lentils or split peas. Add the melted butter and dates and blend until mixed evenly. Transfer the mixture to a 9-inch pie pan, and press the mixture with your fingers to cover the bottom and sides of the pan. The consistency should allow for you to mold the crust to the pie pan evenly. Pour in your favorite pie filling and bake according to the pie recipe instructions. Alternatively, if you need a pre-baked bottom crust, heat the oven to 350 F and bake for 10 minutes until the crust begins to brown. After 8 minutes, check every minute or so, to ensure the crust doesn't overcook. Nuts will stay freshest and last longer when stored in the freezer. Make sure they are in an airtight container. You can place frozen pecan nuts directly into the food processor. To add a layer of flavor your friends and family may not expect, add spices to this nut-based pie crust that complement the pie's filling. Only use a small amount—1/2 to 1 teaspoon is sufficient and should be added first to the liquid ingredient in the pie crust (in this case, the melted butter) before it's mixed with the remaining ingredients. Simple spices to consider adding to custard pies include 1/2 teaspoon pumpkin spice and 1/2 teaspoon orange blossom water. An apple pie would be delightful with 1 teaspoon of vanilla extract and 1/4 teaspoon of anise. 1 teaspoon of dried thyme leaves would bring out the citrusy taste in a lemon meringue pie and give off an inviting aroma as well.